We have upgraded security when sending your sensitive documents. Attention tax pros! Michael Gray gives a live presentation tomorrow! IRS processing delayed by federal shutdown. Will Premium Assistance Tax Credit be allowed? U.S. Supreme Court will rule whether severance pay is exempt from FICA. Value of gifts can be reduced by a promise to pay related estate tax. Deduction for long-distance commuting expenses denied. Tax advisors should renew their IRS registration. 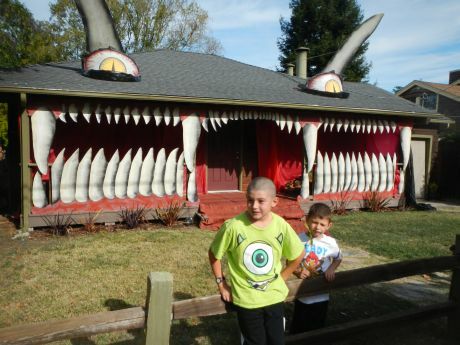 Kyan and Clive Baker in front of a neighbor's Monster House. Thanksgiving is going to be late this year, on November 28. That day will also be the first day of Hanukkah for those of the Jewish faith. We wish you a very happy and safe holiday and hope you are able to spend the day with your family or loved ones. My brother, Stephen, and I are celebrating our 62nd birthday this month. It's good to still be here in good health! You should notice that our procedure has changed for when we send documents with identification numbers or otherwise sensitive documents. The service is called Share File. The good news it's easy for clients to use because no password is required and there is no involved procedure for uploading documents to a portal. Clients can also use the service to send documents to us via a link at our web site, www.taxtrimmers.com, or via a link that will eventually be nested in our emails. This is a much simpler process than the portal that we have been using, so we hope you like it better and use it. Attention tax professionals! Michael Gray gives a live presentation on November 7. Michael Gray, CPA will give a live lunchtime presentation, "Tax Planning Issues for IRAs and Retirement Plans", for the Tax Interest Group, Silicon Valley San Jose chapter, California Society of Certified Public Accountants. It will be located at Abbott, Stringham and Lynch in San Jose. The investment is only $20 for CalCPA members or $25 for nonmembers. Here's a link with details, or call Stephanie Stewart at 408-983-1122. The IRS has announced that they won't be able to start processing 2013 income tax returns on time, because they were shut down for 16 days during October. They need more time to prepare for processing the tax returns. The expected date for the IRS to start processing 2013 income tax returns is about January 28, 2014, but no later than February 4. The April 15 filing deadline won't be changed. Despite the delay in being able to submit income tax returns, we urge our readers and our clients to go ahead as you normally would and get your information to your tax return preparer early to avoid a bottleneck and applying for an extension of time to file your income tax returns. District court will rule whether Premium Assistance Tax Credit will be allowed. A federal district court will hear a lawsuit challenging whether residents of states that use the federal website exchange to purchase medical insurance under Health Care reform will be eligible to receive tax credits for a portion of the premium. The IRS said in regulations that residents of those states should receive the same tax benefits as residents of states that provide their own web site exchanges, like California. That doesn't seem to agree to the strict language of the law. Congress could clean up this issue with a technical correction, but the Republicans in the House of Representatives haven't expressed any interest in preserving the Health Care legislation. This issue probably won't be resolved for a while. The U.S. Supreme Court has resolved a split among the federal circuit courts of appeal about the FICA treatment of severance pay. It will review the case, In re Quality Stores, 2012-2 USTC 50,551. The Tax Court has ruled that the value of a mother's gift for gift tax reporting can be reduced by the value of the donees' promise to pay the estate tax that could result. Although this case may continue to be significant for families with very high net worths, recent tax law changes have eliminated the estate tax as a concern for most U.S. residents. The Tax Court upheld the IRS in disallowing deductions claimed for commuting to a long-term job site. Only expenses for commuting to a temporary job site are tax-deductible. Under the IRS PTIN program, tax return preparers are required to renew their registration each year. You can do it at the IRS web site, www.irs.gov. I had some trouble being thrown out of the system, but succeeded in my renewal early in the morning, possibly when there was less traffic on the site.